Do you remember singing at Thanksgiving at Rockefeller Chapel? Did you ever forget a piece of your uniform or lyrics to a song mid-concert? 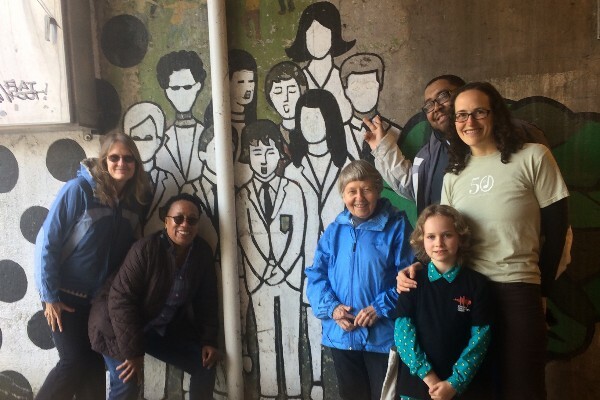 Do you remember the original Spirit of Hyde Park mural by Astrid Fuller (1973) on 57th street with the red jackets? Have you ever tried to explain to friends, colleagues, or family who were not IN the Chicago Children's Choir what that experience was like or how it impacted your life, and struggled to articulate it well enough to help people understand its significance ? Now, more than ever maybe, the current political and social climate demands the need for the story of this incredible organization's history AND impact to be recorded. The Chicago Children's Choir has played an important role as an anti-racist arts organization that successfully transitioned through some very difficult times from a charismatic lead small group to a professionally lead organization that was able to expand and stabilize. Here's part of my personal story behind this project. 2016 meant my daughter, Molly, was old enough to join the Chicago Children's Choir, of which was hugely important and influential in my life when I was a member (1988-97). Last summer was the 20th anniversary of the life-shaping tour to South Africa, so I posted photos almost daily for a month reconnecting with alumni from that trip ("20 years ago today we were..."). Listening to her rehearsals at the Humboldt Park Neighborhood Choir with Danny Wallenberg, who was one of my conductors 20 years ago, has brought back incredible memories and powerful emotions. Every time she sings Jubilate Deo and Revelations, I tear up. At the First Unitarian 60th anniversary birthday service for the Chicago Choir fellow alumna and conductor, Mollie Stone, invited the alumni in attendance to introduce themselves, and say a few words about when they were in the choir. I thought, "I wonder what the choir was like in the decades before me. I wonder what stories alumni from before my time might have? I wonder if anyone has asked them. Someone should record their stories." Finding myself significantly underemployed given the Illinois & CPS budget crises, with a Ph.D. in Education and lots of coursework experience with qualitative research, I proposed to the choir that I do some archival work, and interview alumni/ae, former staff, former board members, and parents of alumni/ae (list to date is on the website for the book: www.sarahedennis.com/book_project). They consented but requested that I be clear that I am doing this voluntarily and on my own. Disclaimer: This publication will be a project solely conceived of and created by the author and is not a publication created or endorsed by the Chicago Children's Choir. The money that I hope to raise here will cover the printing costs (estimating a 200 page softcover book with a few photos), editor, and money spent getting copyright permission. After covering the printing costs, I would love to be able to give a discounted copy to many who so generously donated their time in speaking with me (nearly 100 people!!). The remainder would be a greatly appreciated donation towards my time (estimated many thousands of hours by completion). I would also love to work on future projects (like an alumni/ae yearbook and directory project, even organizing events for alumni/ae by geography, such as NYC and LA). I have often described the choir as having been like a third parent to me growing up. It was so influential, and I would love to continue to hear and record alumni's experiences, and the impact they feel the choir had on their lives, specifically focusing on people who have been out of high school for at least 20 years. All donations are greatly appreciated, no matter the size from $10 to $25 to $100+. -at the CCIT (Concert Choir in Training) level ($50-74) will have your name listed in a "thank you" section of the book, and also have the opportunity to have your donation listed in honor of, or in memoriam of, someone who played a role in the life of CCC, in addition to your print copy. This size donation will help provide a complimentary print copy for alumni/ae/former staff who contributed their time for interviews. - at the Madrigals or Contemporary Singers level ($100+) will include all of the above and will help become seed money for potential future projects such as this to honor and connect alumni/ae, former staff, parents of alumni/ae, etc. I've just found a few more former staff recently! Still working hard to have an accurate a celebration of so many hundreds/thousands of people who helped make the CCC happen (over the first 40 years)! To date, I've been writing chronologically! I'm up to 1987-1990! This vital work needs our support, and before I ask YOU to stretch, I must to do. Give not until it hurts, but beyond that to where you feel great about making a difference, as Chris did for us. I want to see the book publishes and it will inspire everyone when they read it.